Outline Sam, Dean, Castiel, Jack, and Rowena track a flesh-eating demigod, but that turns out not to be their biggest threat. Dean: Yeah. Who would just let themselves be eaten? Hey, I'll say it again, my money's on witchcraft. Rowena: Och, you. Always blaming witches. Dean: 'Cause a lot of times, it's witches. Rowena: Speaking of which, I'm also curious as to how your brother is managing to keep an archangel locked away inside his mind. Sam: Because... he's Dean. And Dean is Dean. He's fine. Dean: 'Dean, I see you standing alone by the truck reading this note. I see you and the tall man and the red-headed witch chasing me. I will always see you. Stop, or I will make you stop. Regards, Noah.' I'm on a first-name basis with some psycho pen pal. That's aces. Dean: Maybe you're not his type. Rowena: What did you do to that boy? When I cast the transformation spell, I felt something else pushing back, some other thing inside him. It's volatile magic, powerful and it's stitched to him like some kind of parasite. I was curious before, but now I am worried, so I'll ask you again, Sam. What did you do? Rowena: Fine. Don't tell me. But using dangerous, mysterious magic, regardless of the cost... that's a very on-brand me thing to do. Victim: You're just preying on -- on helpless men? Noah: 'Helpless men' -- that's rich. No, I do eat ladies, too, but women have become so cautious lately. Must be all that finally waking up from centuries of misogynistic oppression. Good for them. Bad for you. It's so bad for him, isn't it, Felix? Castiel: But, Jack... you know, Sam and Dean, they're human, and they're very extraordinary, brave, special humans, but they're -- they're still humans. And humans burn bright, but for a very brief time compared to, you know, things like us. And eventually, they're gone, even the very best ones, and we have to carry on. It's just -- It's part of growing up. Jack: What's the point of being a cosmic being if everyone I care about is just gonna... leave? Castiel: It is, but it's also living. So when Dean wakes up -- and he will wake up -- we just have to remember to appreciate the time that we all have together now. Michael: That's not very nice. And if we're not being nice, what if... you couldn't breathe? That's a terrible feeling, isn't it? What if you were also blind? Michael: And what if you just hurt? But... fun as this is, I think... no more games. This time, you all die. This time, the world burns. Michael: I am the commander of the host! The cleanser of worlds! I will not be challenged by a child! Jack: I am not a child! I'm the son of Lucifer. I'm a hunter! I am a Winchester! The Ouroboros is an ancient Egyptian symbol depicting a snake eating its own tail. It was adopted by the Greeks and most famously used in alchemy. Pantera was a American heavy metal band. Dean: Okay, so, what? This guy's some real Houdini? Harry Houdini was a famous magician and escape artist. 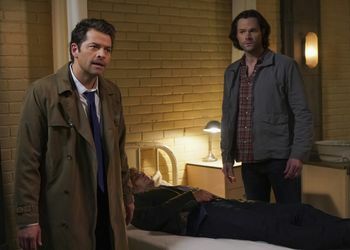 Castiel: Okay, um... these killings -- it seems like there's a ritualistic quality to the crime scenes, right? It's almost liturgical. It means religious. Liturgical refers to the rituals and performance of public worship. Rowena: I believe we are hunting a gorgon, an ancient cursed being, with an affinity for snakes and a hunger for human flesh. Dean: Oh, yeah. Clash of the Titans? Turns guys to stone? In Greek mythology a gorgon was a creature whose gaze could turn a person to stone. The most well known are the three sisters -- Medusa, Stheno, and Euryale -- who had live snakes for hair, and who would turn any person who looked on them to stone. There are two movies called Clash of the Titans, both of which tell the story of Perseus and his battles against gods and monsters. Dean has possibly seen both the 1981 version of the movie and the 2010 version. Dean later makes another reference to Clash of the Titans when he mentions things coming out of Medusa when she was killed. Dean and Castiel use the aliases "Page" and "Jones" for their FBI covers, referring to Jimmy Page and John Paul Jones from Led Zeppelin. The dog Rowena transforms Jack into is a Brussels Griffon breed. Rowena: Yeah, well, assuming you're not all paralyzed or eaten... off with his head. "Off with his head" is a common phrase associated with decapitation, most famously uttered by the Queen of Hearts in Lewis Carroll's book Alice's Adventures in Wonderland. Noah's story of the black snake and the chicken is an African folktale from Liberia known as "Black Snake and the Eggs." You can read it here. This episode marks Jensen Ackles' 300th appearance on Supernatural as Dean Winchester. While not fully named in the episode, promotional material lists the gorgon Noah's surname as "Ophis." Ophis is the Greek word for serpent. Dean, Castiel, and Jack have coffee at a Mexican restaurant called El Sabrosa. When Dean and Castiel are talking to the police officer, Castiel holds his badge upside down, referencing the episode 5.03 Free to Be You and Me where Castiel and Dean pose as FBI agents and Castiel initially holds his badge upside down before Dean corrects it. Continuity Error: While reading the note that Noah left him, Dean says, "I see you standing alone by the truck reading this note." However, the actual note does not contain the word "alone." This episode marks a rare occasion where Castiel is armed with a weapon other than his angel blade on a hunt. Like the Winchesters and Jack, he wields a silver machete when fighting Noah. It's shown that consenting to becoming a vessel does not need to be done verbally. Rowena gave Michael the needed permission simply by nodding her head. In the past, consent has always been given out loud. Michael reneged on the deal he made with Rowena to be his vessel, just as he had done with Dean in 13.23 Let the Good Times Roll.